This is a new pre-construction condominium proposed by the Madison Group for Toronto’s Yonge and Eglinton neighbourhood. 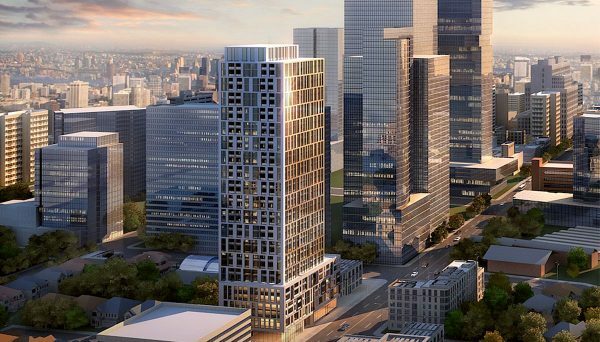 A contemporary, mixed-use project, 90 Eglinton Avenue West Condos is slated for a 2022 occupancy. Madison’s proposal for this midtown Toronto condominium calls for a 24 storey structure comprised of a three-storey podium and a 21-storey tower. The tower will house 227 residential units, including a mix of one and two-bedroom layouts. 7,340 square-feet of retail space will be located on the ground floor, while 31,549 square feet of office space will occupy the first, second and third floors of the podium. 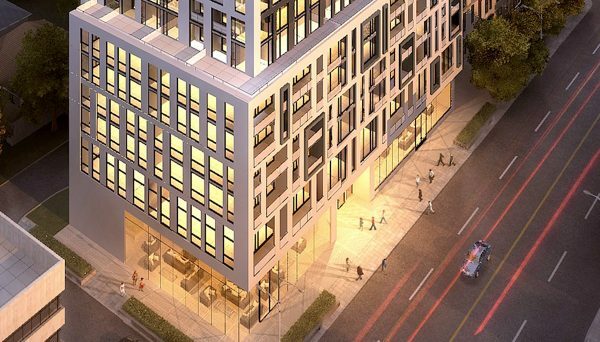 Access to both the retail and office portions will be from Eglinton, while the building’s residential entrance will be located off Henning Avenue, on the site’s western portion. Condominium residents will enjoy 4,596 square feet of indoor amenities, including a squash court and a pet spa. A portion of these amenities will be located on the fourth floor, where they will connect to a lavish 4,000 square-foot outdoor terrace. Madison’s proposal also calls for underground parking, which will house 95 residential spaces and 30 spaces for the building’s office and retail tenants. Yonge and Eglinton is arguably one of the fastest-growing, most dynamic neighbourhoods in Toronto area. The city has designated it as an “urban growth centre,” a major hub where growth is expected and planned for accordingly. Once considered the edge of the city, a flood of sleek high-rise developments, along with high-end retail and commercial additions have made the pocket an extremely desirable neighbourhood to work and live. 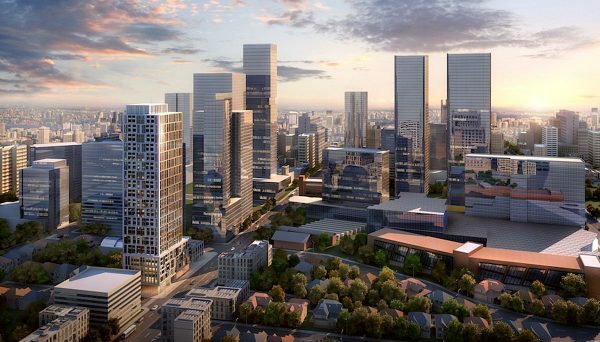 The trend shows little signs of slowing down and the amount of condominium proposals in the works will make the area one of the densest neighbourhoods in Canada, with space for over 20,000 new residents in the next ten years. It’s a great place to invest! A large portion of this growth comes in anticipation of the Eglinton Crosstown LRT, which is expected to be running by approximately 2020. Once completed, the LRT will add almost 20 kilometres of rapid transit, spanning from Weston Road in the west to Kennedy Station in the east. The addition of this system will make the neighbourhood one of the only locations in the city with rapid transit access in all four directions. Studies show that modern homeowners and tenants prefer to live close to transit and live either within walking distance or within short transit commutes to their workplaces. it scores a 97 on its Walk Score and a 94 on its Transit Score. It’s a high-energy, modern place to call home where high-end retail, world-class dining, entertainment and lifestyle amenities are at your fingertips. Popular with young professionals who crave the urban environment, we’re also seeing more and more young families choosing to call the area home, thanks to its proximity to schools, parks and community facilities. The Madison Group seems to have a knack for creating some of the region’s most talked-about projects, whether it’s a collection of luxury townhomes on the water or a sleek high-rise in an urban corridor. Built on a foundation of 55 years in business and spanning three generations, they incorporate desirable locations, contemporary architecture and resort-inspired amenities into each of their developments. They’ve managed to perfect the idea of creating lifestyles, not just buildings, which is just one of the reasons we think this new project will be an extremely desirable place to call home. 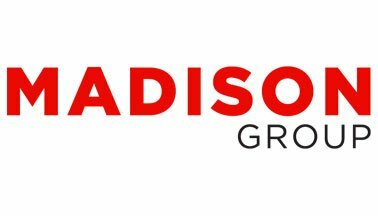 Read more about The Madison Group.